Dhanush starrer Thodari is all set to hit the screens on the 22nd September. 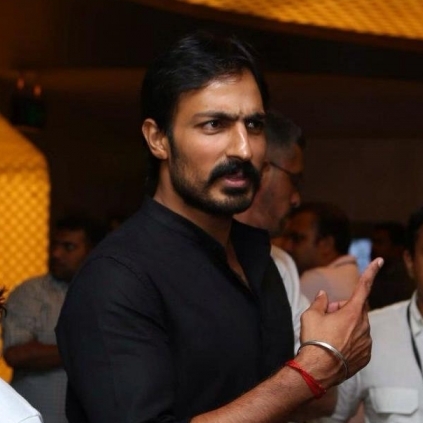 Harish Uthaman the handsome villain of Pandia Nadu fame plays an antagonist in the film. He shares with behindwoods about his experiences working in the film. It is the first Tamil movie that is completely shot in a train from the beginning to the end. There were many challenging situations and sequences. When Prabhu Solomon sir told me that the story is happening in a train, I was very excited because I love heights. I was excited to shoot for the film and enjoyed working in it. I play a commando who is travelling from Delhi to Chennai. A situation in this travel is the movie all about. Thodari will be the next step in my film journey. Dhanush was extremely cooperative in spite of his vertigo. He was very sportive and carried out all the instructions of the director. We had a fight sequence on top of a moving train. We did it without the rope. It was quite risky, but we managed to pull it off, thanks to the entire team. Dhanush although a global celebrity has no airs and is a down-to-earth person. Prabhu Solomon sir is a brilliant actor. You just have to follow his directions. We did that. He is a real hard worker. We had shot for a long duration without even taking breaks because we cannot stop the train. It was a good experience. We shot in a place called Rayagada in Odisha, a Naxal area. When talking to the locals, they said that Naxals live inside the forest and when in need, they will come out and kidnap people. They said as a matter-of-fact and we were kind of thrilled and scared. Keerthy Suresh is an amazing co-artist. She is a thorough professional and very supportive. For a scene, I had to grab and drag her by her hair. I knew for sure that would have hurt her but she did not even flinch. When the director told me the scene, I told beforehand to Keerthy that I will be hurting her and apologized in advance. She just said, ‘let’s get the scene done'. Harish is eagerly waiting for the release of Thodari and the audience's response. We wish you the best Harish! Guess which Bollywood star is a big Tamannaah fan! ARM's producer is elated, says the excitement level is astonishing! Sunny Leone to enter your living rooms! People looking for online information on Dhanush, Harish Uthaman, Keerthy Suresh, Prabhu Solomon, Thodari will find this news story useful.